2016 has been an unusual year in many ways. Weatherwise we had a lot more rain than the past years. According to SFgate.com, in October this year we had 200-300 times more rain than the typical October average! This December has also been very cold. The temperature has dropped to low 30's Fahrenheit in the Bay Area for this entire week. My immediate concerns are the plants particularly the young mulberry tree and the passion fruit vine. I can't bring them inside at night. All I can do is cover them up and hope for the best. On the first night the temperature dropped to the 30's, the top tip of mulberry tree got frost damage despite being covered up in a big plastic bag. The passion fruit is holding up better. I have not seen any damage to it. On the second freezing night, I covered the mulberry tree with 2 big plastic bags to make sure all parts were covered. Unfortunately this morning I found the bags being blown away from the tree! It was freezing and crazy windy last night! The wind had completely blown the bags away from the tree despite all the rocks I used as weights on the bags. Some of the leaves on the tree are turning black. That is not a good sign. I can't wait for this cold temperature to pass. The yard is now a complete mess with mud and covered in fallen leaves and overgrown weeds. I am a huge fan of free stuff. 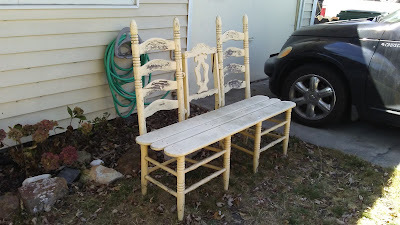 From the free stuff, I often think of how to repurpose them to make my life easier. A few months ago, a family with several young children across the street was moving. At the end of their moving sale, they had a huge pile of things left out on the curb for free. One of the items was a Stokke Flexi infant bath. I almost didn't take but then I thought Cracus could take his bath in it instead of in the big bathtub. I would use less water and be able to stay dry. It is so easy to give Cracus a bath now, I bath him more often than I used to. Since the baby bath is small, he can't really try to run away. I have seen other baby bath before, and this one has the best design for converting to dog bath. It's foldable to save space when not being used. It also has a rubber plug on the bottom to empty out the water after a bath. I usually drain out the dirty water then fill it up again to rinse Cracus off with clean water. I give Cracus treats during his bath to make it a positive experience for him. Recently I switched to Bobbi Panter Bad Hair Day dog shampoo, and Cracus seems to like it better than what I used before. I got the shampoo for Kelsey initially since Kelsey has a lot of dandruff and sheds a lot. It worked amazing on Kelsey's hair, too. The dog shampoo costs more than my shampoo, but it's worth it for me. While visiting the old Sand Village Farm last week, I dug up one of rooted cuttings of passion fruit in the rain. I put it in a small temporary blue container before I could find the time to plant it outside. 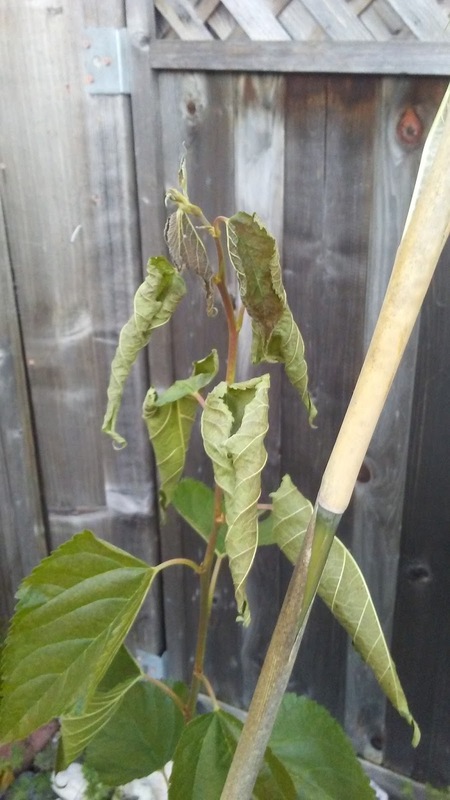 Remember the 4" dwarf mulberry tree I ordered last year around this time? Well, it's about 4 feet tall now. I put the passion fruit cutting next to it for comparison. I am sure by spring the mulberry tree would be at least as tall as I am. I can't wait to have fresh mulberries right in my backyard! I picked a spot that is sunny for the passion fruit. It's next to the kiwi vines. Since the passion fruit is still so small, I needed to put something around it to protect it from the pups. They don't bother plants much, but occasionally one of the pups would just decide to attack a random plant. 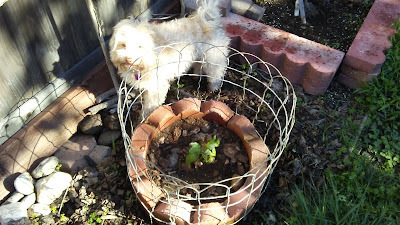 Since the mulberry tree no longer needs extra protection, I moved the wire plant protector over to the passion fruit. As you can see, Cracus was very curious about this new addition to the garden. He kept sniffing and circling it. It was about 9:30, and everything was still wet outside from the morning dew. 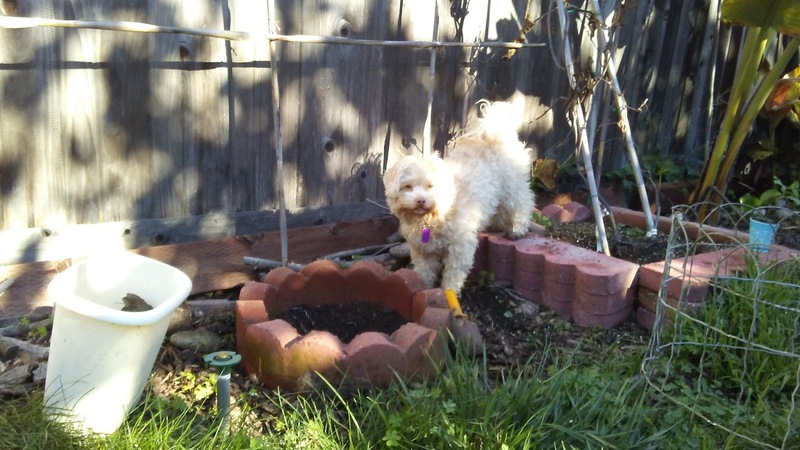 His paws and tummy got quite muddy from stepping all over the damp soil. By the time I was done, I could not let him back in the house without a bath. Bath time will be the next topic. Over the weekend, Cracus and I returned to the old Sand Village Farm to check on the plants. 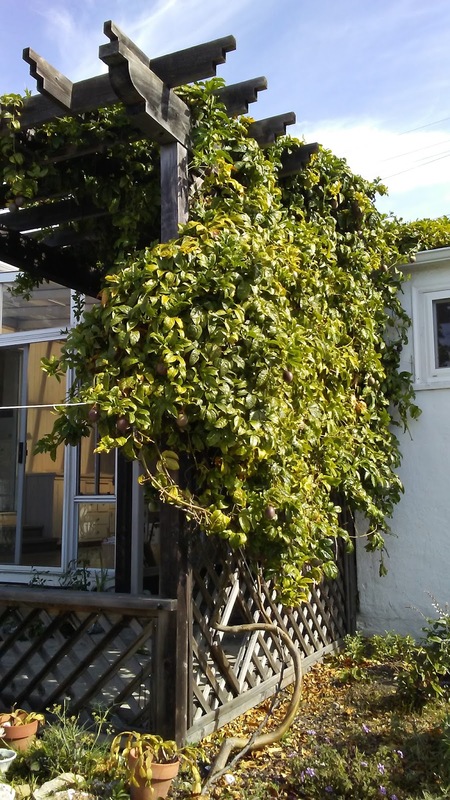 Take a look at the passion fruit vines! This is basically just one plant as you can see in the photo. It's now covered the entire arbor and reached the roof. Remember when I first blogged about it back in 2011 when it had its first flower? There are fruits hanging down everywhere now. I like to pick the ones that are ripe, so usually they already fall on the ground. Those are the sweetest. They are dark purple. If you touch them while they are still attached to the vines, and they come right off, that means they are ripe. If you have to twist or pull them, then just wait for a few more days. Cracus was so excited to be there. He ran around like a mad dog. He is always so enthusiastic about everything and every place he visits even though he has been there many times. 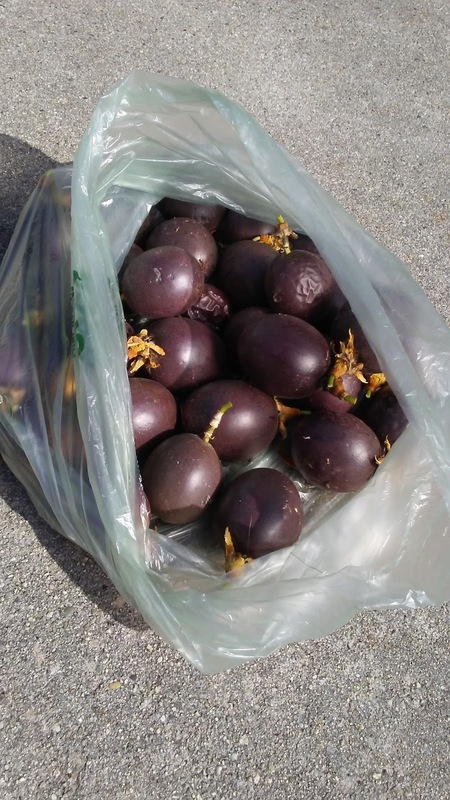 I just walked around and picked up all the passion fruit on the ground. There were more than 20 of them. I can't wait to propagate some over to the new location. People need to know about this delicious fruit that has ten amazing health benefits. It's high in vitamin A and C, both are strong antioxidants. It's also high in fiber. A full list is available here on the fitness wiki page. 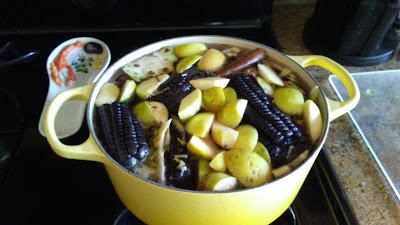 However, I love it because it smells amazing and tastes so good. It always reminds me of my grandfather, who shared them with me when I was a toddler. 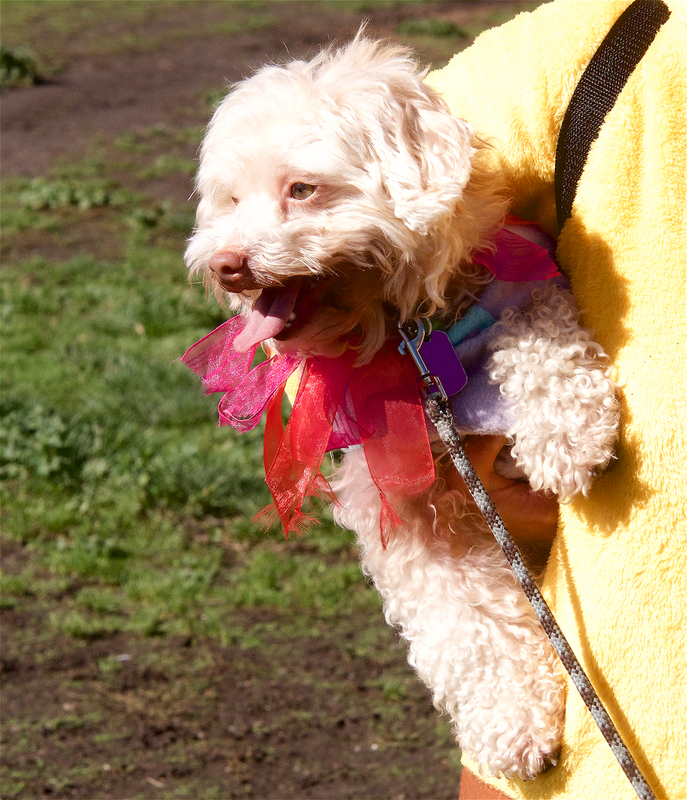 Earlier this year Cracus completed an intro circus class at Canine Circus School in Oakland. It was obvious to everyone in the class that Cracus has two speeds - running fast and stop. He did all the training as fast as he could. He was impatient when he had to wait for his classmates to take their turns. He is a natural for doing circus tricks, so I continue to do the routines and make new ones with him at home. Recently my "sidekick" Katie from next door has been going on walks with me and the pups. As we pass by different playgrounds, Katie always wants to go on the slides. Cracus is always eager to join Katie. He'd run up the stairs as fast as he can and also run down the slides! We have played on the slide and the swing behind El Cerrito Library. 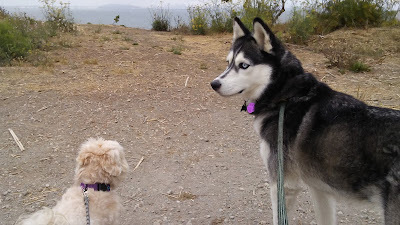 Katie wanted to go to Cerrito Vista Park . I didn't know which park until we arrived. I used to pass by this park everyday on my way to junior high school. It didn't have these fancy play structures back then. Cracus ran up and down the slides with Katie. I wish I could get a slide for our backyard! I walk around the neighborhood a lot with the pups. While I walk, I often find pleasant surprises that I would not otherwise discover. I know where the vegetable patches and good fruit trees are. 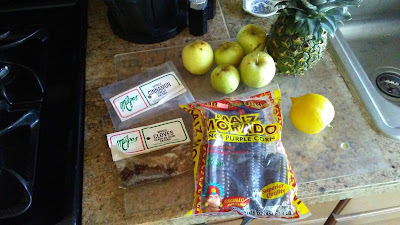 I can basically do an edible walking tour in the neighborhood. 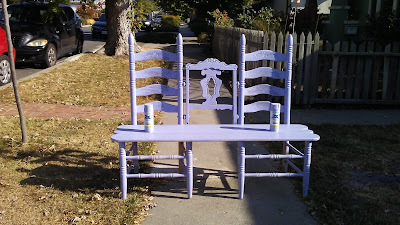 I also tend to get the first dibs on many curbside freebies. A few days ago I came upon a box of free stuff while I was walking Cracus. In the box, there was a copy of Garbage Warrior. By looking at the photos on the back cover of the DVD, I could tell the guy on the front cover, Michael Reynolds, uses garbage such as used tires and bottles to build houses. Wow! He uses things people throw away and turns them into something everyone needs. This is a movie that is right up my alley! I was very excited to take the movie home with me. When people think of garbage, it's often something ugly, dirty, and useless. The houses Michael Reynolds built are beautiful and functional. I didn't even realize the colored glass balls embedded in the walls are actually used glass bottles! After watching the movie, I Googled more about Michael Reynolds. I realized this movie was released in 2008, so there had to be more progress on his projects in the last 8 years. I found out that people can rent one of his "Earthships" to experience living in a fully sustainable house, which provides food and electricity. 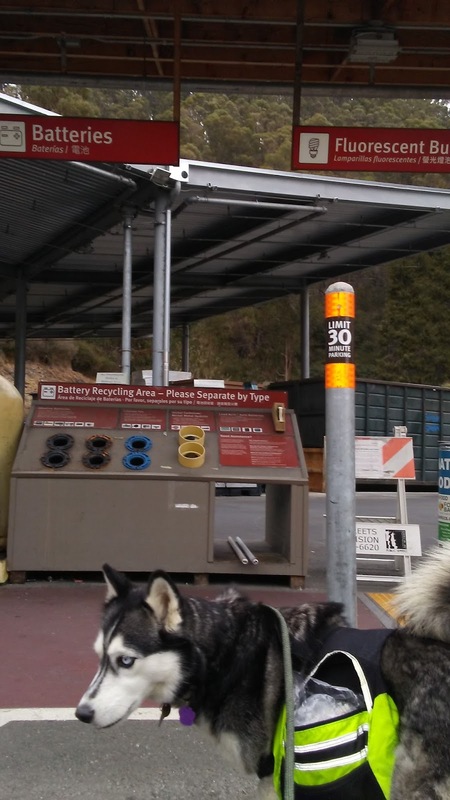 Some of these nightly rentals are even dog friendly! 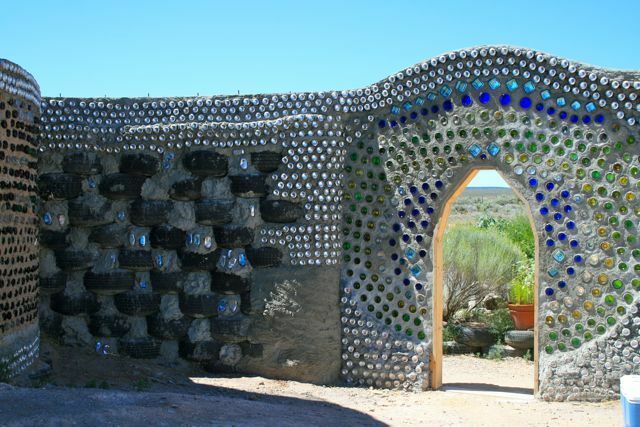 People can also attend Earthship Academy to learn to build these sustainable off-grid homes. This is just incredible. I knew there are a lot more fascinating sights and inspirational creations for me to explore and experience. The movie is available on Youtube and Vimeo for free. I am happy to share this movie below with anyone who is open minded. Enjoy! 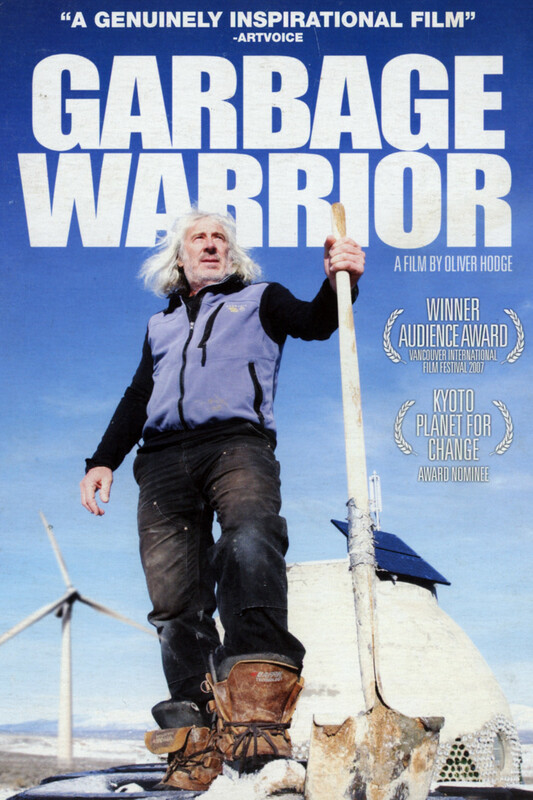 Garbage Warrior Full Length from Louis Stamatelos on Vimeo . For years I have heard of Albany Bulb as the other awesome dog park that is comparable to Point Isabel, where I am a regular for the last seven years. 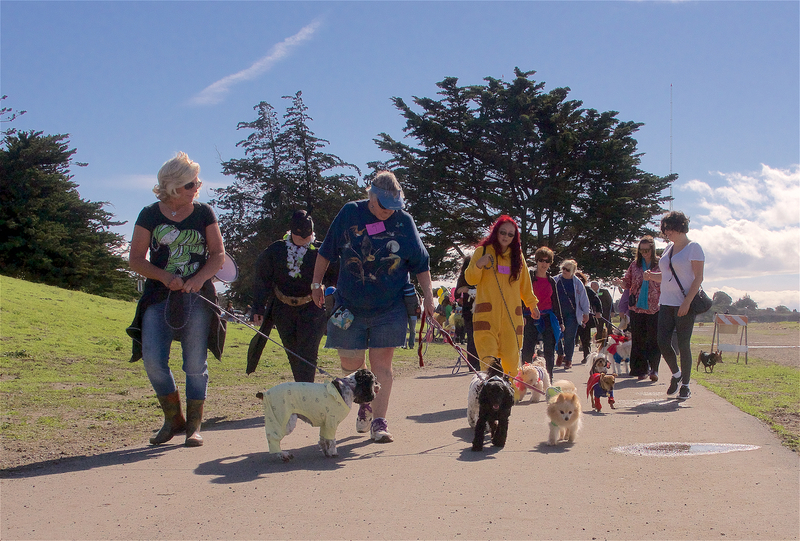 I didn't really think any other dog park would be as great as Point Isabel, so I never drove the extra two miles to check out Albany Bulb. Since foxtails have been quite a problem at Pt. Isabel this summer, I have not been going there as much. 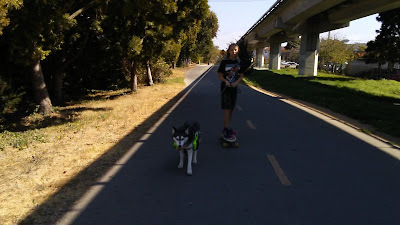 Last Saturday, while 4 other dogs were under my care, I wanted to take the whole pack somewhere fun. My little helper from next door volunteered to hang out with us for the day, which made it easier to pack up the car with all six dogs for an adventure. We arrived Albany Bulb around 10 a.m. on Saturday. We had to park all the way at the end of the trail leading to the beach. It was a little difficult for Kelsey who is now about 14 years old. For her size, she is equivalent to a person in late 80 to 90 years old. 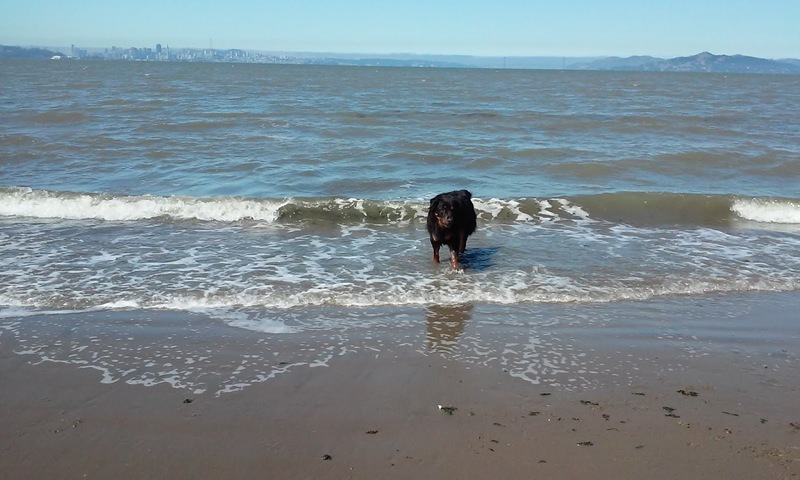 When we finally got to the beach, we were all excited. I had no idea that Albany Bulb is a sandy beach that you can walk into the ocean. Since it was on a Saturday, it was very crowded. We stayed for only about 45 minutes. I took Cracus and Kelsey back to Albany Bulb on Monday morning, and we were able to park very close to the beach entrance. 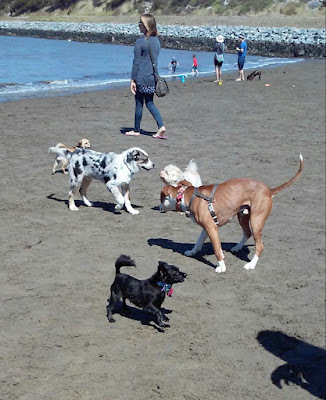 There were only a handful of people and dogs at the beach, so everyone had a lot of room to roam. Kelsey enjoyed dipping her paws in the bay while Cracus ran back and forth near the water. Kelsey even attempted to chase a ball next to a young hound. This time I brought fresh water with me, which proved to be a good idea as both Cracus and Kelsey got really thirsty. We have found our new favorite dog park! In early May, I received a doggie daycare request for a tiny Maltese puppy named Momo. Momo means peach in Japanese. As soon as I saw the name, I knew there was some kind of Japanese connection. Momo's entire family came to the dog park to meet Cracus and me. I learned that Cracus behaves better when he meets other dogs on mutual ground first. However, when I saw how small Momo was, I was a bit concerned. Cracus is usually a bit rough and plays like a boy with whoever plays the same way. He often plays with dogs who are either a little bigger or much bigger than he is. Momo looked like a little gentle girl. She rolled on her back with her belly exposed as soon as Cracus approached her. I was worried that Cracus would be too rough. He also tends to grunt a lot when he is excited or just playing. Momo's mom, who is Japanese, didn't seem too concerned. 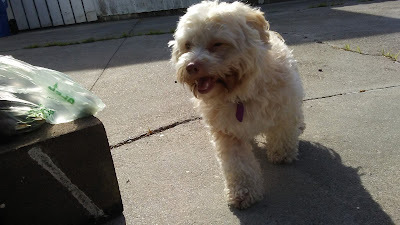 Momo's dad, who has an European accent, was amused with the way Cracus walked on his hind legs. They were excited to talk to me about dogs since Momo is their first dog. Shortly after their visit, they confirmed Momo's daycare for the month of June. To my surprise, Momo plays just as wild as Cracus. Even though she is small, she is fast, fearless, and has even more energy than Cracus! I realized that Cracus has met his match on the first day Momo spent with us. 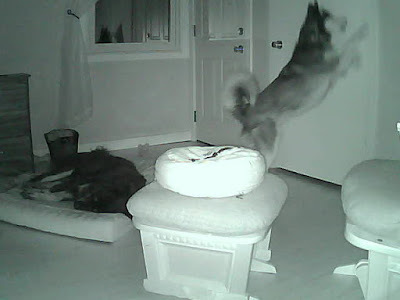 Here is a short video clip of how crazy they played with each other! Momo's dad has been dropping off and picking up Momo everyday. One day he mentioned how Off the Grid was holding up the traffic so he couldn't pick up Momo sooner. We started chatting about how expensive food trucks are selling their food. It's almost as much as going to a restaurant. He asked me if I have heard of Roli Roti. Yes, of course! I used to see Roli Roti all the time at farmers' markets! He was pleased that I knew of his food truck. It has been a while since I visited a farmers' market but how can anyone forget the sight of a truck full of rotisserie chickens? I remember how good it smelled. 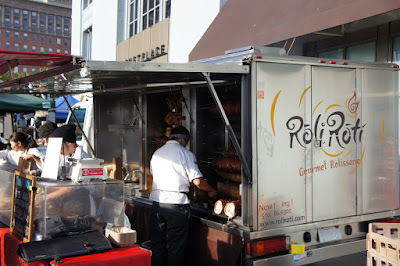 I was stoked to learn that Momo's dad is the owner of Roli Roti! Wow, suddenly I felt that I have met a celebrity! Needless to say, he is a busy man. Momo ended up staying with us overnight a few times. He was going to pay me extra for all the late pickups and overnight stay, but I was more interested in tasting Roli Roti again after all these years. He brought me a chicken last week. Tonight he brought me a big chunk of porchetta. It suddenly felt like Thanksgiving. After taking a few photos, I cut off 1/3 of it to give to my next door neighbors. They have been mowing my front lawn ever since we moved in and helped us with all kinds of repairs. I will be sure to share any goodies with them. Tomorrow I will bring another 1/3 of it to my parents. There is still a lot of porchetta after cutting 2/3 off. I wonder if I could freeze some for later? Cracus likes to explore along the fence looking for any place that he can dig and slip under. He enjoys visiting the neighbors on his terms. 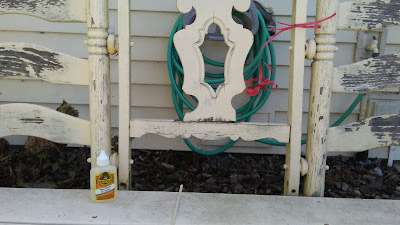 One of my constant tasks is to walk along the fence and make sure that all the weak spots are patched up or blocked. As you can see from the video above, Cracus is vigorously scratching the fence. Luckily I just picked up a few more free bricks on the sidewalk this morning. I knew exactly what to do with them. I placed the bricks against the fence, so Cracus can no longer scratch the base of the fence. There are other areas of the fence that are blocked off by various bricks and other objects. I have a collection of free bricks just for this purpose. Cracus was disappointed after the bricks got in his way, but I am sure he will come up with something else to keep me on my toes. We have been having more rain and overcast days than usual this year. It rained yesterday. It is May, and we are still having rain. This morning looked like another hot soup day. It was overcast with the potential to rain any second. Around 1 pm the sun finally came out and the sky became clear. I was so excited to open up both patio umbrellas that I rescued from the curbside. Cracus joined me in the yard as I worked on weed removal. I wasn't planning on growing any tomato just because tomato isn't something I crave for usually. However, a friend of mine gave me a couple Miracle Gro cherry tomato seed pods a few days ago, so I had been looking forward to planting them. I cleared out all the weeds growing in my planter box before digging two holes for these pods. To my surprise, I found some mint in the planter box. I carefully pulled all the weeds around it. After I was done, I sat down in the shade for a few minutes to pet Kelsey, who always likes to lay in full sun. I turned around to gather all the garden tools, and that was when I noticed a hole where I just planted the pods. Cracus looked at me from a few steps away. Did he eat it? It had to be him. I ran inside and found dirt all over Kelsey's big bed. Cracus ran after me and lay right next to it proudly. I shook my head and started to clean up. I replanted the "pod" back into the hole but made it deeper. Hopefully he is not going to do it again. I got some left over kabocha so I decided to bake some kabocha peanut butter treats for the pooches. They love eating kabocha straight, but I don't want them to have diarrhea from eating too much of it. 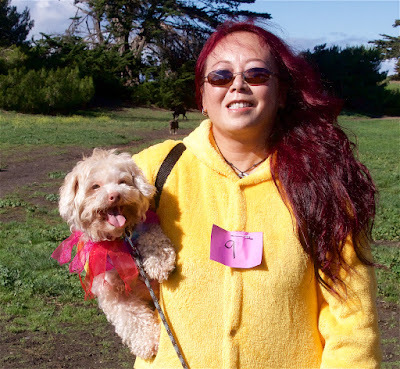 One of my favorite dog treat recipes is peanut butter and pumpkin dog treat. Today I substituted canned puree pumpkin with cooked kabocha. Dog treats are super easy to bake. Unlike human cookies, you don't add butter or sugar. 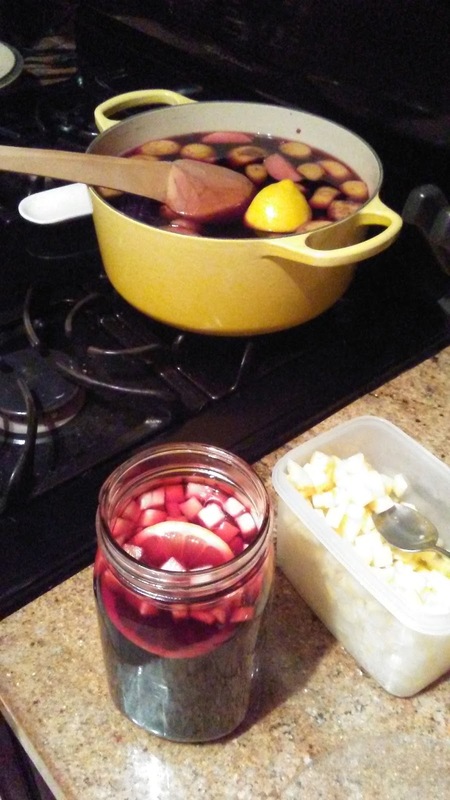 Cracus and Kelsey went crazy just from the smell of the ingredients mixing together. I got some very cute paw shape cookie cutters a while back, but I probably won't be using them anymore unless I was making human cookies. The dogs can careless what the shape of the treats are. If I was going to use the cookie cutters, I would have to get my rolling pin out. I would then have to wash the cutters and the rolling pin. The cutters also make the treats way too big. I just use my hands and roll the dough into small balls and flatten them a little with my hands. While the treats were baking, Cracus and Kelsey refused to leave the kitchen. As soon as they were done and cooked down, I left them have a few. As you can see from the clip below, I could not get Cracus to sit at all. He was just too excited over the home baked treats and practically bit into my fingers as he took the treat. I tried a piece of the treats, too. It tasted like a piece of very healthy cracker. 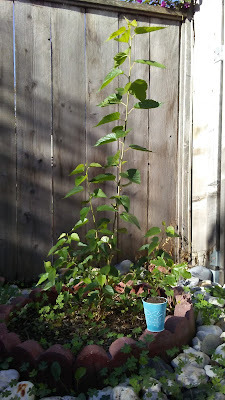 Back in October, 2015, I ordered a 4" Dwarf Everbearing Mulberry Plant from Hirt's Gardens via Amazon.com. I have ordered other plants from them in the past and highly recommend it. If I had the time, I would try to grow everything myself from seeds or cuttings, but time is scarce these days. 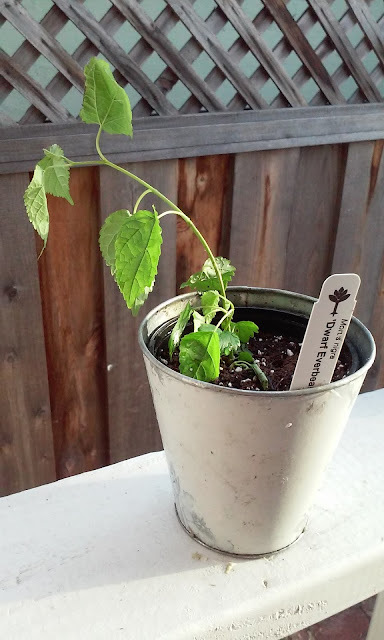 For nearly five months, I have kept this 4" mulberry plant in my kitchen where I setup a table as an indoor plant area. It really doesn't seem to have grown much at all. I have been thinking of transplanting it outside now that spring is coming and weather is getting warmer. I couldn't think of a nice spot for it, and getting rid of the useless tree on the far end of the garden seemed to be a major project until a couple weeks ago. The useless tree suddenly fell over one night. Although I was a little sad about it, I was also happy at the opportunity to use that area for a more useful tree, a tree that produces food. After removing the fallen tree last weekend, I spent more time in the garden to transplant the 4" plant into its new home. So far so good. I just need to make sure the dogs stay away from it, and the soil gets good drainage. Last Tuesday evening was very windy. In the middle of the night, I heard something but didn't think much of it. When I got up on Wednesday morning and looked out of the window, I was surprised to see the tree as shown in the photo above. Initially I was a little sad because it was a big tree, and now it will need to be removed. We had more rain in the past few months than the past several years, and its shallow roots got wet rot. It didn't take much for the tree to fall over. 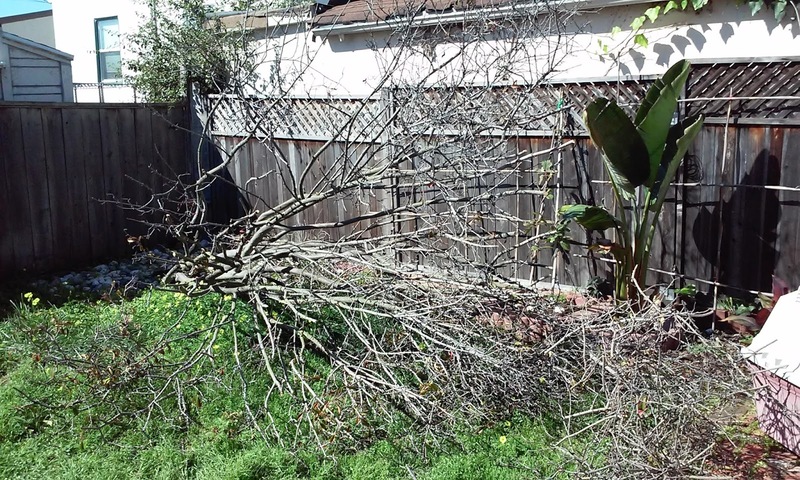 During the weekend, I started breaking the small branches apart. For bigger branches, I used my Silky Pocket Boy to saw them apart. 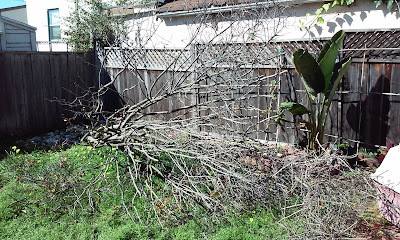 My wonderful next door neighbor came over with his electric saw on Sunday afternoon and saw apart the biggest branches. He's saving those pieces as firewood for summer camping. After all the tree parts were removed, he came back with his lawn mower and gave my overgrown backyard a complete makeover! See how nice it looks now in the photo below. 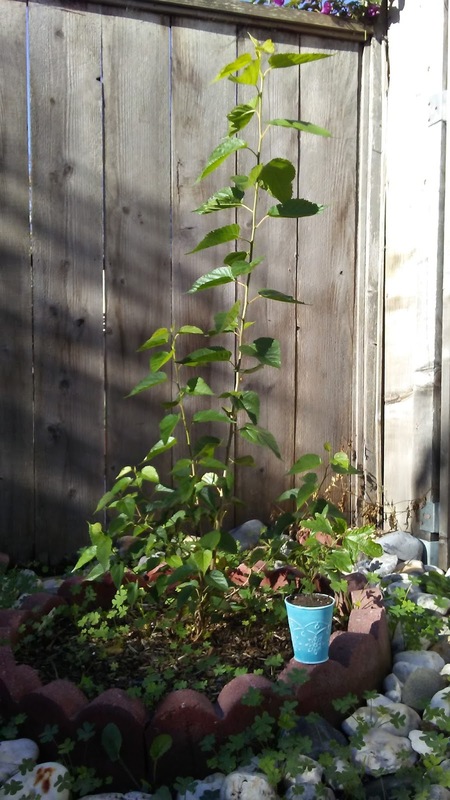 I ordered a very small dwarf mulberry tree a few months ago. I will work on improving the soil condition and transplant the mulberry to where the tree was before. 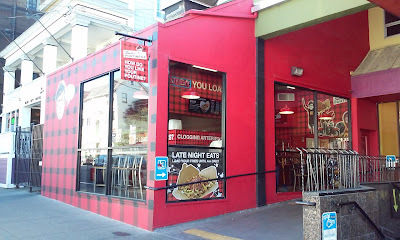 Someone told me about Smoke's Poutinerie in Downtown Berkeley a while back. Poutine is a Quebec classic consists of french fries, gravy, and cheese curds. At Smoke's, they have over 30 varieties of toppings in addition to the traditional cheese curds. They have grilled chicken, steak, bacon, scrambled eggs, pulled pork, Korean BBQ, with BBQ sauce, cheese sauce, chili, sour cream, Sriracha, etc., etc., the combination could be limitless, and you can even design your own. I love french fries and anything else that can possibly come with them. Smoke's is right in my old hangout, but sadly it took me over a year to make it there. This is the sad part about growing up and having a job. You just don't have time to explore your own neighborhood anymore. I made a special trip there today on President's Day since I have the day off from work. I got there 15 minutes before 11 o'clock, when they open. I was lucky to find parking right across the street from it. 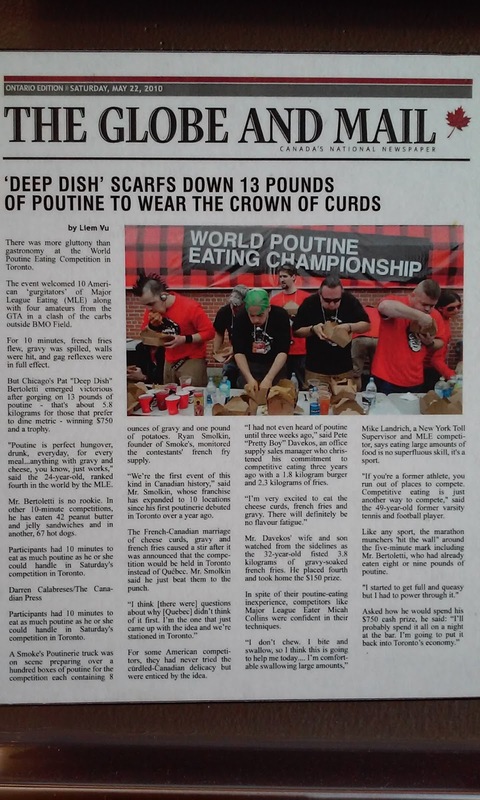 Since it was my first time there, I wanted to try the traditional poutine, which is called Traditional Veggie Poutine, with fries, rich brown vegetable gravy, and Quebec cheese curds. 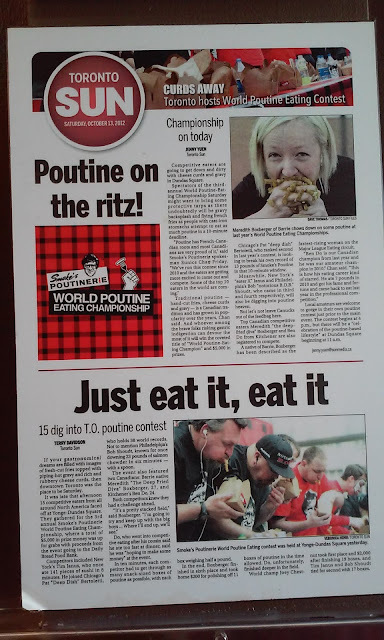 While I waited for my poutine, I looked at their wall of poutine news. How exciting! It reminded me of my trip to Middle Earth, when I took the time to explore each street and local eateries. 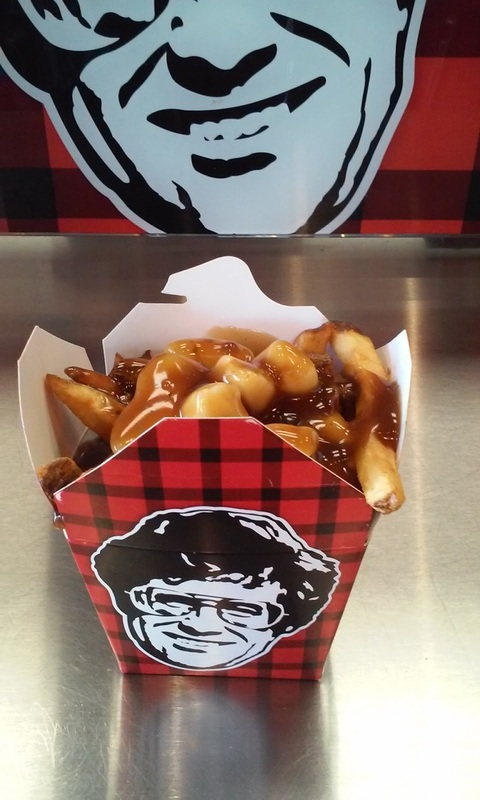 I ordered a snack size poutine, but it is enough as a meal. The cheese and gravy are both great. The gravy has mushroom bits in it. Of course I love the fries. I hope to return and try other combinations.